As winter draws to a close it was astonishing to see how South African parkrun registrations continued to grow despite the cold weather. Each week there were about 3,000 new registrations, and what is it about the magic of Botanical Garden in Pretoria that it consistently remains a world leader in registrations? I wonder how much we will grow once the warmer spring weather arrives. As a response to this growth we have continued to launch new parkruns, though at a slower pace in winter. Last Saturday we welcomed Ladybrand parkrun to the parkrun family. 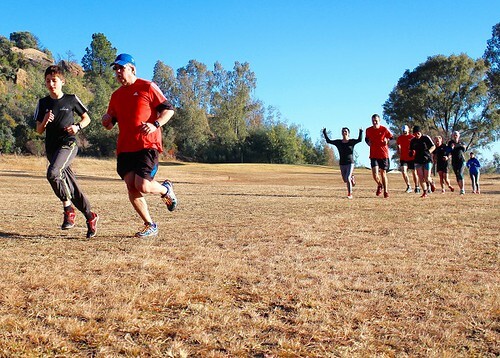 Anthony Halse and his team had been planning the new Ladybrand parkrun for several months and the inaugural Ladybrand parkrun was finally launched on the Ladybrand golf course. Everyone braced themselves for freezing weather as Ladybrand had recorded temperatures as low as minus 8C this winter. In fact, a cold front blasted its way through South Africa a few days before the launch. But while it was cold on the morning, it was nowhere near as cold as anyone had anticipated. Ladybrand is very close to the Lesotho border and we parkrunners could see the snow on the Maluti mountains. It was a beautiful backdrop for a challenging but fun parkrun. A good crowd of local and tourist parkrunners ran the first parkrun over thick frost at times. On the 20th of this month we will start one of the most remote parkruns in South Africa when Springbok parkrun is started. The local hotel is full as several parkrun tourists have made plans to travel to this remote corner of the Northern Cape. The Nkomazi parkrun event director was delighted to receive a donation of running shoes for the local running community collected by parkrunners from Ireland. 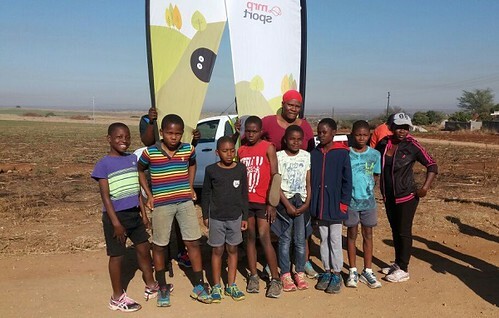 Nkomazi parkrun already boasts 3 youngsters who have earned their 50 milestone club status running the parkrun barefoot. Event Director Lordrick Mathonsi would like to thank the Irish parkrunners for their generous donation. We have teamed up with TenBits to provide a barcoded wrist-band (see the image above). This wrist-band includes your parkrun barcode and emergency contact details. In addition, a portion of the proceeds contribute towards parkrun costs. For more info and orders please visit the TenBits website. Can you believe we’re just three parkruns away from the official start of spring? With sunnier weather right around the corner, there’s no better time to overhaul your active wardrobe with sunshine-inspired gear! Shop your faves online at www.mrpsport.com – just in time for those spring runs. Beyond the change of season, we’re also celebrating Klerksdorp parkrun’s second anniversary! The MRP Sport team will be out and about – so if you’re in the area, join us at Klerksdorp parkrun, come and say hi, and of course, feel free to ask us about any of our active gear and accessories. And on that note - with regards to your hard-earned achievement tees, we are working through these and they will be with your local parkrun event director soon! We look forward to seeing you sporting them at your parkrun soon! The 2016 Rio Olympic Games have begun and we’re excited to share the Olympics fever with all of our Vitality members. 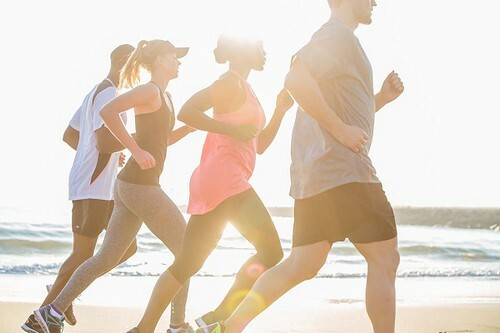 As the Official Wellness Partner of the South African Olympic Team, we want to celebrate your personal bests with incredible competition prizes. You could be the lucky Vitality winner of a trip for two to the original home of the Olympic Games – Athens in Greece – including flights, accommodation, transfers and a tour of the Pan-Athenian Stadium where history was made as the site of the first modern Olympic Games. To enter, simply share your own personal best (PB) story with us online via any of our Vitality social media platforms: Facebook, Twitter or Instagram using the hashtag #MyVitalityPB. Join us on our Vitality Facebook page every day of the Olympic Games at 12:00 midday to answer one of our Olympic-themed trivia questions to stand the chance of winning daily prizes from our Discovery Vitality and Discovery Card partners including vouchers, magazine subscriptions, hamper gifts and more. Terms and conditions apply. Join us in wishing Chad and the rest of our SA Olympic Team all the best as they strive for their personal bests at this year’s 2016 Rio Olympic Games. My son has been asking me for months for me to take him on a run. He is only 6 years old, but he has grown up watching myself, Seleste, my dad, Trevor, my aunts, Tracy and Glenda, and cousins, Jane and Caitlin run and he was desperate to be a part of the family sport. I was a little bit nervous as he hasn’t run at all before but I finally gave in and said we could do the Century City parkrun. He was so excited, I bought him a pair of running shoes and a long sleeve top from Mr Price Sport. The weather wasn’t looking good the night before and I asked him “what happens if it rains, are we still going?” He said “yes,” with a very confused look as to why I was asking this question – he is clearly a true runner! The morning came and he jumped out of bed to get ready all excited and off we went, I still had no idea what to expect from him. But to my surprise he is faster than I expected and I was huffing away to keep up with his shouts of “run faster, Mom”. He absolutely loved it and he did the 5km in 43 mins, which is amazing for his first run. He is now hooked and I promised him we will do more parkruns. I also realised I need to train to get faster so I don’t hold him back! 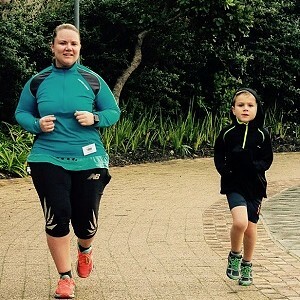 Thank you so much, for a safe and controlled running environment where I felt completely at ease to run with my son and let him experience the joy that is running. You will be seeing both of us a lot more from now on! At parkrun I am treated as an equal and am part of the community regardless of my ability. This isn’t always the case in the case in the outside world. Drop us an email if you have an interesting parkrun related fact, happening or comment that you would like to share with all parkrunners! How has parkrun changed your running / fitness? Sadly I am unable to participate in the parkrun as a runner or walker. However, volunteering has improved my mental wellbeing tremendously. Being the Volunteer Coordinator for Hartenbos parkrun and assisting the Event Director in other ways has filled a void which was left when I retired about 4 years ago. Favourite volunteer role:​ Volunteer Coordinator and non-official “cheerleader” every Saturday. What do you like about volunteering at parkrun: ​My “hubby” is an enthusiastic parkrunner and has completed 85 runs. With me volunteering we can enjoy parkrun together. We get up extra early every Saturday morning to help with the pre-event setup and interacting with everybody as they arrive. While “hubby” is doing the run I encourage him and the other runners (my “cheerleading”), recruit new volunteers, chat with the existing ones and help wherever I am needed. After we helped with the post-event close down, we have a coffee and something to eat at the local Farmers Market where we socialize further with other parkrunners. I really enjoy building relationships with the parkrunners and volunteers. We are like a big family and I just love all my nicknames which include, amongst others “Tannie Ita”, “Auntie Ita” and “Mamma parkrun”. Saturday mornings have become the highlight of my week. Why should others volunteer at parkrun? It is not only the right thing to do – it is also FUN! Even if you can’t participate in the parkrun itself, you can still enjoy it by volunteering and in the process make a difference. As a parkrunner you also need to “give back” because no parkrun can happen without volunteers. Most memorable or funniest parkrun moment: A real funny incident that comes to mind is when I kindly offered to be pacer because we did not have a lead bike for the day – and a person from the back shouted, “Tannie Ita, can’t we rather make it another day – the Springboks play tonight!” Our first birthday was very special as most of the runners embraced our “funny hat and balloons” theme. It was such a fun day with prizes, punch and cupcakes and lots and lots of laughter. However, the most memorable day was when I did my 50th event as a volunteer recently. 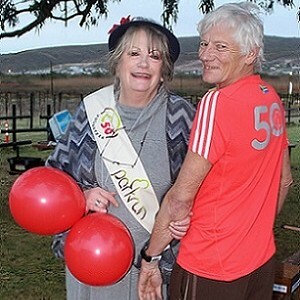 I wore my “50 Volunteer sash” and red balloons with pride and everybody made me feel very special indeed. Thank you Harties parkrun – you ROCK!